The self-styled antidote to the panel shows of the 50s and 60s, ‘Clue’ (as it is affectionately known) has been delighting audiences for more than 40 years. 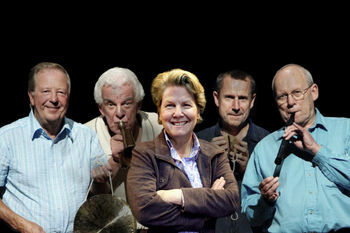 Originally chaired by Humphrey Lyttleton until his death in 2008, whereupon a series of guests hosted before Jack Dee took over the reins in 2009; the show sees two panels of two comedians embark on a number of silly tasks - some of which will have a musical accompaniment, courtesy of Colin Sell. Overseeing proceedings during this special series of live dates will be comedian, writer and regular presenter of the channel’s News Quiz, Sandi Toksvig. She will be joined by the show’s familiar faces Tim Brooke-Taylor, Barry Cryer, Graeme Garden and Jeremy Hardy.